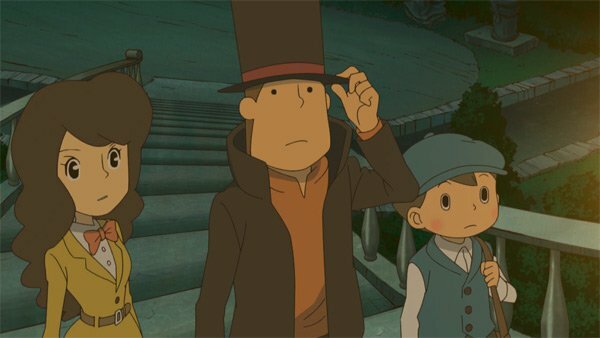 Fans of the series and curious newcomers will find a lot to like about Professor Layton and the Miracle Mask. With four entries under its belt, the Professor Layton series has grown into one of the Nintendo DS’ flagship exclusives. Now, the series makes its transition to Nintendo’s next-gen handheld with the fifth game, Professor Layton and the Miracle Mask. While it does give the art style and certain interface elements a makeover, it doesn’t stray from the style that the series previously established. However, challenging puzzles, an engaging story, and plenty of gameplay make it a no-brainer for those already invested in the franchise. Though it’s the latest game in the series, Miracle Mask is only the second chronologically. Starting with the previous game, Professor Layton and the Last Specter, newer titles take place before the first three entries in the series. 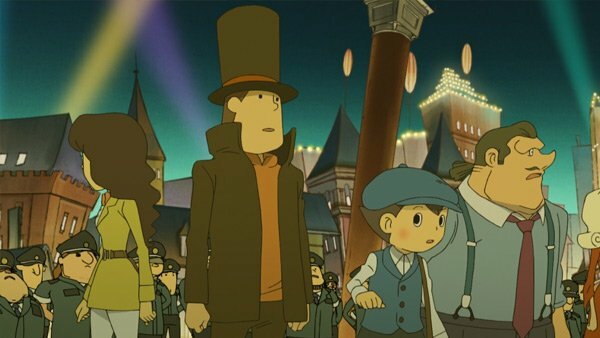 Not that it matters a whole lot, as Layton games, while containing occasional nods to past characters and events, mostly stand on their own as self-contained adventures. Things begin with Layton receiving a request from an old friend to come to the Las Vegas-like city of Monte d’Or. The professor has already been established in previous games as a Sherlock Holmes-like crimesolver with keen observation and deduction skills, and he is called into action once again when a new threat appears. With his longtime apprentice Luke and newer assistant Emmy, who made her debut in Last Specter, Layton initially finds Monte d’Or to be a charming locale, with festivals and parades all over the place. However, it doesn’t take long for the problem the letter specified to show itself in the form of a mysterious individual known only as the Masked Gentleman. This troublemaking stranger appears to be pulling off impossible feats, such as flying, walking on air, and causing unfortunate citizens to fly into the sky or be turned to stone. The Masked Gentleman’s motives are a mystery, as is his identity, thanks to his possession of a legendary artifact known as the Mask of Chaos. We find out that Layton has past experiences involving the unearthing of the mask, which occurred in his school days, and he along with some old friends may have some connections to the whole case. From there, it’s a journey through the city to collect clues and information, and eventually unravel the secrets of the Masked Gentleman. The Professor Layton series has always had a strong reliance on plots despite its main emphasis being puzzles, and this is mostly no exception. Things do start a bit slow, but once other characters and incidents are gradually added to the mix, it’s able to pick up and find its footing. The game is divided into several chapters that make up the whole story. Select ones switch the location and time up completely to have players take control of young Layton and company back in his hometown, with the events there being revealed bit by bit to flesh out the mystery and characters. Gameplay is entirely based around the touch screen, with not a button press to be found. Players will spend a lot of their time navigating through the various environments that make up Monte d’Or and interacting with both the people within them and the environments themselves. Using the touch screen, players navigate somewhat similar to a point-and-click PC adventure game, with a tap of the stylus being used to talk to other characters or move to a different location. The biggest factor in the series, of course, has always been the puzzles. Each Layton game contains dozens of bite-sized brainteasers for players to test their wits. The puzzles even factor into the world the characters inhabit. Many characters will only give up information if you can solve the puzzle they offer, and various environmental obstacles such as locks are also presented through various riddles. The puzzles can indeed be rather tricky. Some are trick questions that require you to think outside the box, while others simply take more time and brainpower to figure out. The game does throw you some help in a few ways. These include the memo option, which allows you to write notes on the touch screen if you don’t have a pencil and paper handy, as well as a handy hint system. Scattered throughout the environments are objects known as Hint Coins, which can be spent to unlock individual hints for any puzzle that may be particularly stumping you. You can unlock up to four hints for each puzzle in a predetermined order, with each additional unlocked hint giving more detailed and helpful information to players. This is a welcome system, but the game is smart enough to discourage players from using it for everything. The overall supply of Hint Coins is finite, and there aren’t enough to cover every puzzle. 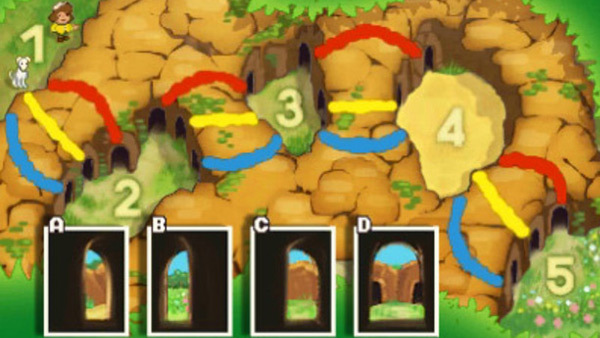 Players will have to decide which stumpers truly call for unlocking hints, especially if they want to earn a high number of Picarats, the game’s equivalent of points. Each puzzle is worth a certain number of Picarats initially, with the general principle being that the harder a puzzle is, the more will be awarded. Put in the wrong answer, and you can still try the puzzle again, but you won’t earn as many Picarats as the first attempt offered. Picarats aren’t essential to beating the game, but they are a nice incentive to play well and think ahead, since building up a certain total unlocks various bonuses such as cutscene players and concept artwork. The only real obstacles players will face besides the puzzles themselves are occasional roadblocks where they must have a specific number of puzzles already solved. There are plenty of optional challenges that players can skip if they’re stumped, but it’s still a good idea to solve as many as possible because of this. The most notable feature Miracle Mask offers compared to previous titles is its graphical presentation. In previous games, all of the characters and environments were hand-drawn 2D sprites and artwork. This time around, everyone and everything has gotten a polygonal makeover – likely taking advantage of the system’s 3D display capabilities. The team behind the graphics has done an admirable job of adding this extra dimension, but it’s still a little jarring to see Layton and company with so much more depth. Thankfully, the series’ light and cartoony art style has gone unchanged, and cel-shading techniques have also been implemented so that things don’t look too overly detailed. Certain cutscenes are also still drawn in 2D, so those who miss the old style won’t be completely left in the dark. Another change comes in the form of the navigational interface. 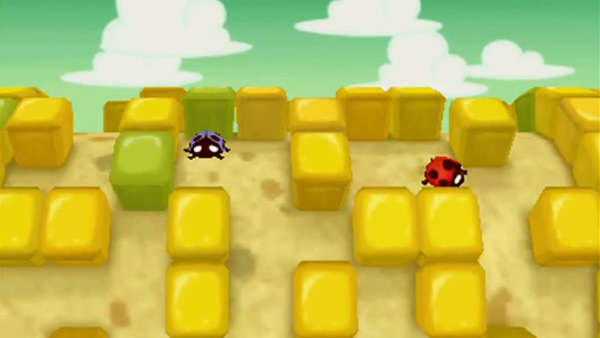 In previous games, each environment would be a static screen, with players having to tap individual spots to find clues, puzzles, and Hint Coins. Here, players tap a magnifying glass icon on the lower screen and use it to inspect the layouts on the top screen by dragging around a cursor that changes color when it comes over an interactive element, which can then be activated with a tap of the lower screen. This revamp makes it easier for players to find hidden objects by letting them scroll over the screen instead of tapping individual spaces, but at the same time, some of the precision feels lost. I found several occasions where I would tap the lower screen, but the game would just register it as an attempt to move the icon a little bit. It’s a minor quibble, but a valid one. Also keeping with series’ tradition, Nintendo plans to make the game’s shelf life a bit longer by offering a new downloadable puzzle every day via Wi-Fi. Even better, players will now actually get some sort of in-game reward. While previous games didn’t offer bonuses or extra Picarats for solving the downloadable puzzles, you can now unlock furniture and decorations for an isometric room. It’s not a substantial bonus, but it’s better than what came before it, and with promises of continued puzzles for the next year, players might find time to play the game even after the main story has been wrapped up. Professor Layton and the Miracle Mask won’t change the minds of people who found the focus on puzzle solving to be a bit off-putting despite some graphical makeovers, but fans of the series and curious newcomers will find a lot to like within it. It’s another great entry in a series that has built a strong reputation, and is the latest must-have for the 3DS. This review is based on the Nintendo 3DS version of the game.